An abbreviation for “marketing communications”, Marcom is targeted interaction with customers and prospects using one or more media. Such as direct mail, newspapers, magazines, TV, internet, etc. To become a successful company, you should understand the difference between what should never change and what should be open for change. This is closely linked to the ability to develop a vision. This is the basis for your public relations program. 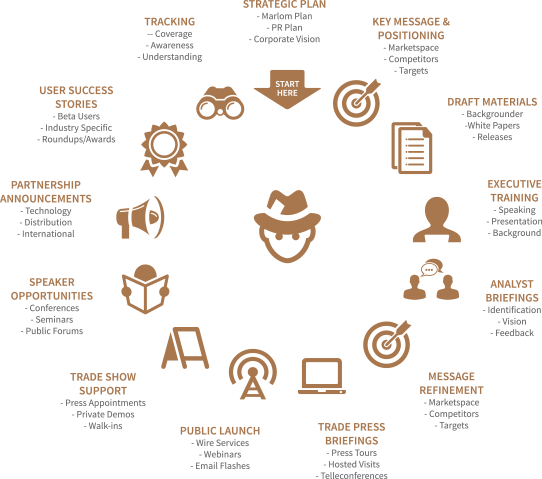 PR plans can either be company-wide or they may focus on specific products or events. Be sure to take the time to really think about your plan. This is a communication-based electronic exchange environment. The world has grown into several industry specific marketspaces which are an integration of marketplaces through sophisticated computer and telecommunication technologies. Having a well-defined target market is the first element to a marketing strategy. These people will be who you direct all your marketing and merchandise to. In marketing you want to assess the strengths and weaknesses of current and potential competitors. Analyzing your competitors can provide both an offensive and defensive strategic context to identify opportunities and threats. public giving information on a particular matter. 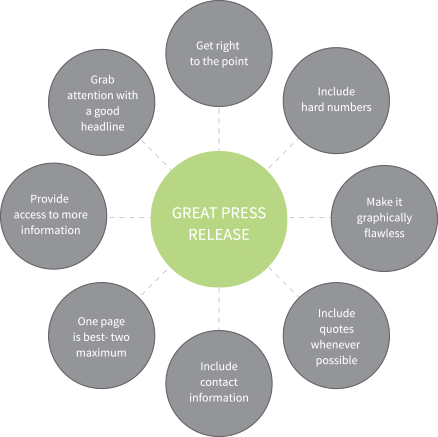 The use of press releases is common in the field of public relations. Typically, the aim is to attract favorable media attention to the PR professional’s client and provide publicity for products or events marketed by those clients. Press releases can announce a range of news items, such as scheduled events, personal promotions, awards, new products and services, sales and other financial data, accomplishments, etc. and demonstrate their latest products, service, study activities of rivals and examine recent market trend and opporunities. People who view their trade show as an investment, build the most relationships on the floor. Set measurable objectives before the event and stick to them. It’s not about how many people come to your booth, it’s about getting the right people to come to your booth. You can do this by sending out email blasts or campaigns before the events. Showing something new to your customers is an easy way to succeed at a trade show. However, if you don’t have the new products made by trade show time, have a prototype or feature it digitally. Putting customers in a trade show is like putting a kid in a candy store. Allow the customer to interact and play with your trade show booth. People remember the staff more than the graphics. A well trained staff is the most important part of your trade show. Giveaways are something customers look forward to. So try to create a giveaway that will make an impression or start a conversation. You don’t want your giveaway to be something already done. You and your competition are in close quarters for several days. Take some time to size up your competition. However, ensure that your staff knows how to distinguish a competitor in the crowd. When a trade show is almost over, this doesn’t mean your job is over. Stay energized and engaged because the last few people may take this opportunity to come talk with you now that the crowds are gone.